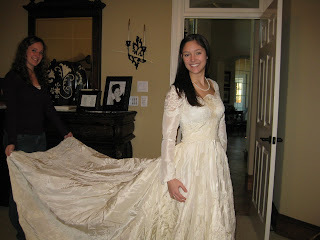 Recap of Part One: We took the dress worn by my grandma and mom out of its heirloom packaging. It had giant brown spots on it. Remaking the stained parts with new fabric. The lemon juice and sunlight faded the stains a little bit, but nowhere near enough to be wearable. Option 1 = fail. The Michigan place never returned my numerous calls and emails. 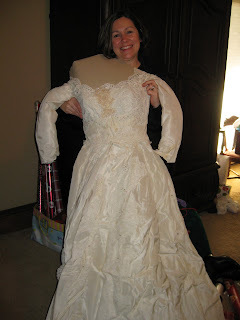 We hypothesized that they only work with museums and things on important pieces of clothing, and don't really care about my old wedding dress. Option 2 = fail. I didn't feel like remaking the dress was worth it. It just wouldn't be the same, you know? Opion 3 = fail. 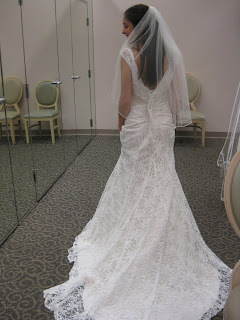 So, 6 months and 2 weeks from the wedding I was left with no dress. I did however have a perfect picture in my head of what I wanted. I wanted that dress. Minus the long sleeves. Minus the stains. I wanted that waistline. I wanted all-over lace. I wanted vintage classiness. 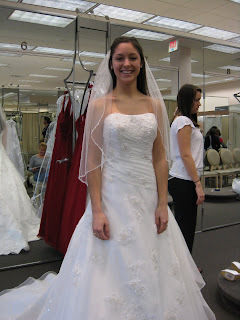 I wanted a scalloped neckline. I wanted fabric-covered buttons. 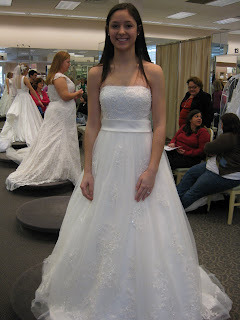 Since I had already decided to do the BM dresses through David's Bridal, I figured I'd try there first. Buying your wedding gown gets you a discount on BM dresses, and I'm all about saving those ladies money! 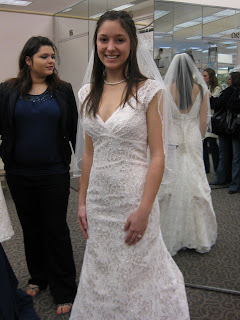 I made the mistake of going to David's on a Saturday following a giant bridal show in Houston, and even though I had an appointment, I felt a bit like everyone there was just a bunch of bridal livestock being crowded into a pen of fitting rooms. But, a bride's gotta do what a bride's gotta do. I told my consultant lady "lace, simple, elegant" and she brought me this. It technically fit my criteria I guess...but it made me feel like one of those Barbie doll cakes where the plastic top half of a doll is stuck into a mound of cake. Where the heck did my bottom half go? This dress made me realize that I needed less poofiness. And apparently I have a strong thing against sequins. Stuck in a mound of cake with dress icing. Sidenote: Looking at this picture is making me think I should maybe wear my hair just. like. that. for the wedding...Hmm. This dress made me make this face. Not good. Where's my scalloped neckline? Why are all these sequins on this dress?!?! I quickly took that one off, and the consultant handed me another one, exclaiming that this would definitely be the one!! This one was definitely better than the others. People I didn't know were going "Oh! That's lovely! That's the one!" My consultant lady was throwing fake pearls on my neck and sticking a veil on my head. No scalloped neckline. No fabric buttons...but I did like it. Everyone kept oohing and ahhing, and I was beginning to think that they were right, that this was as good as it would get without being able to wear my mom and grandma's dress. We proceeded to do the sizing and whatnot. The consultant told me I needed a size 0 Petite. Whoa. 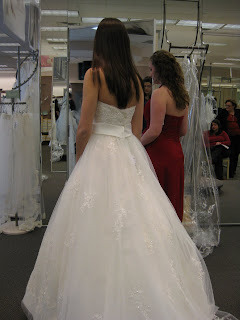 I had heard bridal gowns ran small, but seriously?!? I mean, I'm little, but not that little, right? Okay, consultant lady. You're the expert! But then she told me petite sizes take 6 months to come in. My wedding was in 6 months and 2 weeks. Panic. I made her call the warehouse. They told her there was ONE 0P in stock that could be here in 2 months. She suggested I order it immediately before someone else got it. I panicked. I decided I needed time to think. Could I really buy the 3rd dress I tried on? 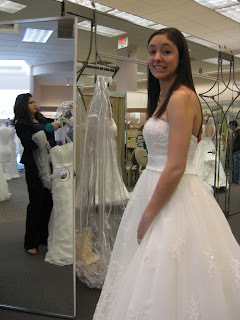 I still just really wanted my mom's dress. But if I waited I could end up losing it! But if I ordered it I could end up changing my mind! I asked her if she could hold the one in the warehouse. She looked at me like I was crazy. The saleslady was getting pushy. I didn't like it. I told her I needed time, and I left. Did anyone else have a similar panicked experience? What would you have done in that situation?